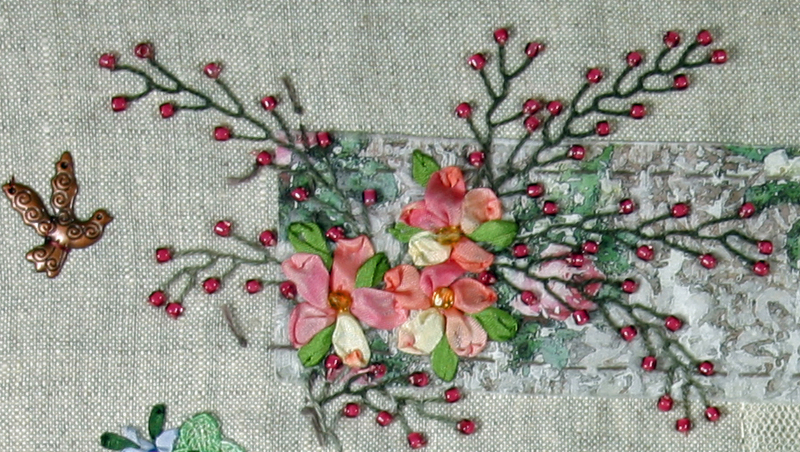 Collaged fabric, embroidery and embellishment on Linen, Remnants of Spring, is my latest piece. It features silk ribbon embroidery over vintage fabrics, digital pictures, vintage napkins and lace. It is embellished with buttons, charms and beads with a lock and key. 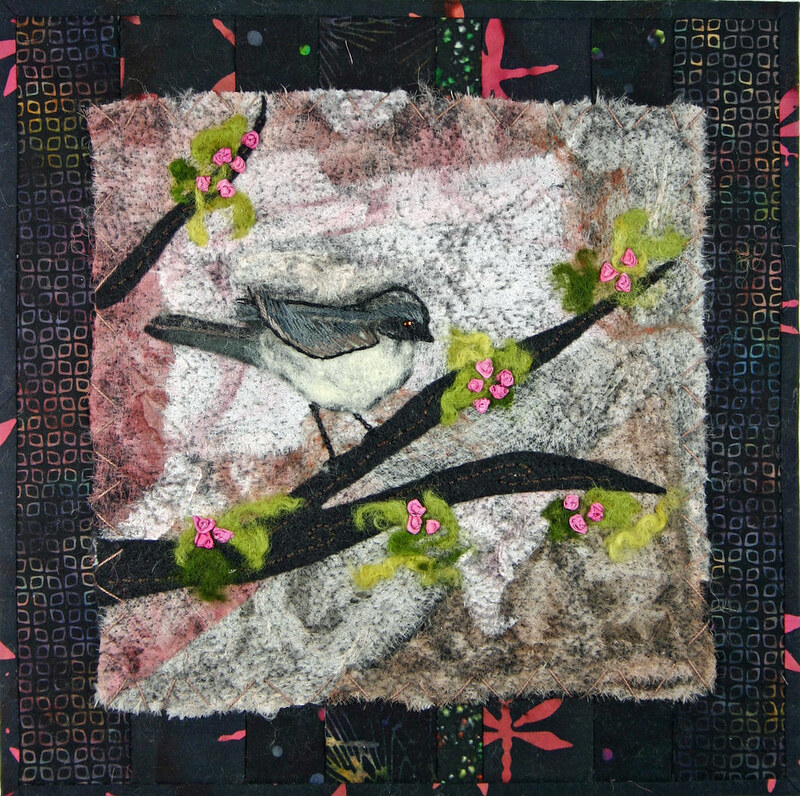 Once finished the linen was mounted on a piece of felt and then a quilted base of crinkled batik fabric. I started this piece while housesitting in the mountains for nine days in December. “Winter Jay” is my latest Twilt. An Arm & Hammer Soda Card from 1916 was scanned and printed on cotton fabric and used as the focal point in the embroidery. Linen fabrics, cotton organdy and lace were stitched together before the embroidery was added. 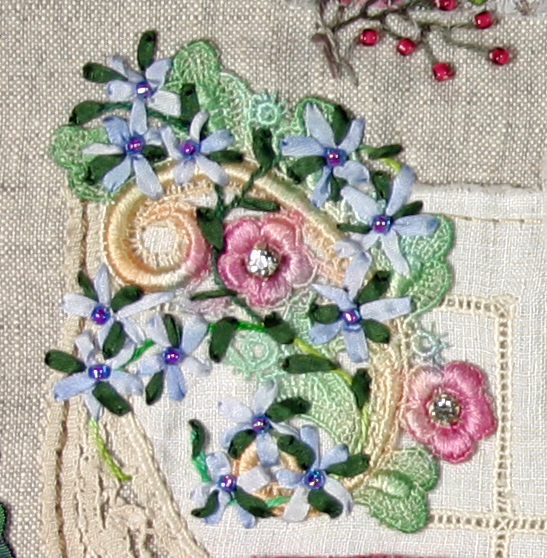 Silk Ribbon leaves, embellishments and beads rounded out the central motif. The embroidery was then mounted on the batik with silk, chiffon and satin ribbons. For more info on the Twilts: Twitter quilts…….Twilts or see all my Twilts :Flickr Twilts Page. Click on the image of the Twilt to go directly to it’s high resolution image. “Sunflower Summer” is my latest Twilt or Twitter Quilt. I printed one of my Digital Collage designs on fabric, pieced on the black borders, layered and quilted the piece. Then the fun began. I added the bow with beads and then the silk ribbon embroidery. The gears, clock face and brass butterfly finished it off. If you are interested in the Sunflower print just contact me directly or through Etsy. The 8″ print isn’t available on Etsy but I could add it. A few days ago I added these Needle Cases and Mini Composition Journals to my Etsy Store. The Needle Cases are scans of Vintage Envelopes that I added Vintage digital elements to before printing on fabric. Once I put the needle cases together I embellished them with embroidery, beads, lace and buttons. The envelope addressed to Col Edwards is circa late 1800s.The other letter was sent from Italy to Long Beach in the 1950s. Embellished Covers are added to Mini Composition books to create the Mini Journals. One is a felted base with Silk ribbon embroidered flowers which was this backed with another piece of felt. The other Mini Journal is linen applied to felt and then embellished with a piece of painted lace embroidery and beads. All four can be found in my Etsy Store. Inspired by the 12 x 12 group I belong to on Facebook, “Old Time Text” uses the word of the month for March: Text. I scanned then printed the fabrics in the background from my collection of vintage and antique books and ephemera. Some are as old as the 1830s. It’s 12 x 12 so it qualifies as a Twilt as well. My latest embellished project, “Organdy Hearts” features cotton organdy hearts appliqued to five of the blocks before the embroidery, silk ribbon and beading was applied. The stitch used to applique the cotton organdy is called the Pin Stitch. I learned this stitch from Elyn Mosbarger a while back.I’ve wanted to revisit the stitch for some time, once I began doing handwork again. I’ve already tempted and taught the stitch to my Crazy Quilt group. Click on the images to see the high res pictures on Flickr. I’ve created a pattern for this project and if you are interested contact me through my email found in the contact section of the Blog. “Chocolate Memories” is another example of the blocks used in the Embellishment Sampler. Each of the nine blocks use a batik square zig zag stitched to a piece of felt. I added a piece of lace, doily or hankie. Trims, silk ribbon and embroidery were added next. It was finished up with beads and found objects. The squares were then added to a quilted piece with beads. The entire piece measures approximately 20″ square. I love doing these little pieces. Block 5 features a photo on fabric of my sweet cat Myke who died a few months ago at the age of 19. A theme can be applied to the whole set or a single small square can be used on a card, a magnet or a book cover. All of my collections of beads, lace, threads and ribbons can be mined for the current block that I am working on. I have so many ideas for my next block that I have a hard time choosing the next one to start. 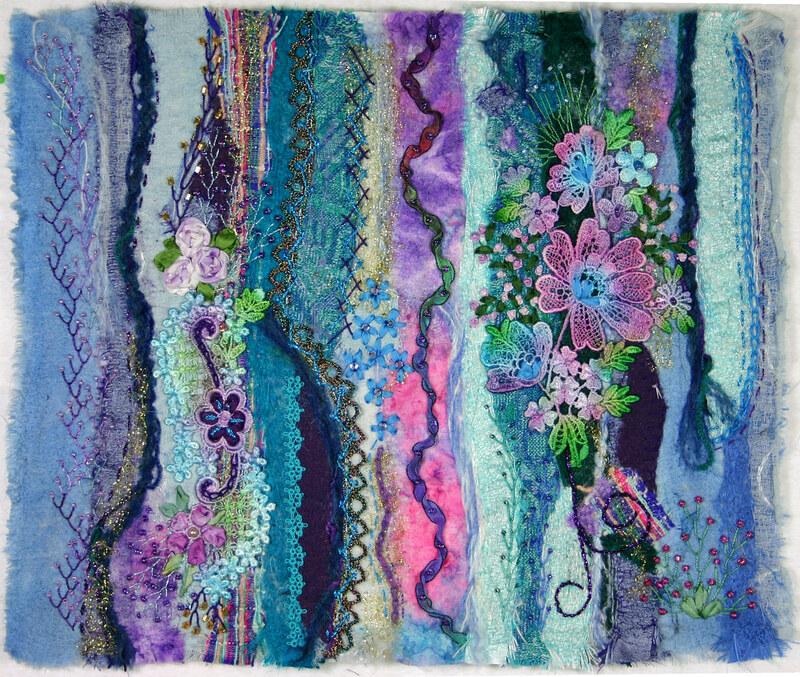 By special request I put together this Embellishment Sampler for a workshop I will be doing in July. I have included many of my favorite embellishment elements. Just as Inchies, Post Cards and Tags have become a popular format for small artwork, I thought that these Tiny Twilts” would be a fun and versatile way of learning new embroidery and embellishment techniques. Each of the nine Tiny Twilts are only 3 1/2″. This little pieces are a lot of fun and would make great Motifs on cards books and needle cases. They are also a great way to experiment with new stitches and techniques. Just a few included techniques: Gathered Wire Edge Ribbon flowers, Basic Silk Ribbon Embroidery, Silk Ribbon Spider Web Roses, Bead Leaf Flowers and Folded Gathered Flowers. Another felted piece, “Tranquil Flora” is my latest Twilt. I’ve been working on the embroidery and beading for a while. Strips of various silks, a little rayon ,cotton organdy and wool yarn with just a touch of metallic mesh were felted onto a piece of white felt with my felting machine. I then added two painted lace motifs with a ribbon and some trim. Silk Ribbon embroidered flowers with additional embroidery and feather stitch in pearl cotton and silk were used to fill in. I finished it off with lots of beads. Click on the image to go to Flickr. My latest Twilt is another felted project, “A Bird in the Hand…”. I am thoroughly enjoying my felting machine. I felted several different colors of scrunch painted silk into a felt background, added felt branches and curly green roving for leaves. This was my first bird and it wasn’t easy. After I mushed it a bit I decided to add embroidery and managed to save the poor little bird. I added some pearl cotton embroidery to the branches and some silk ribbon flowers. 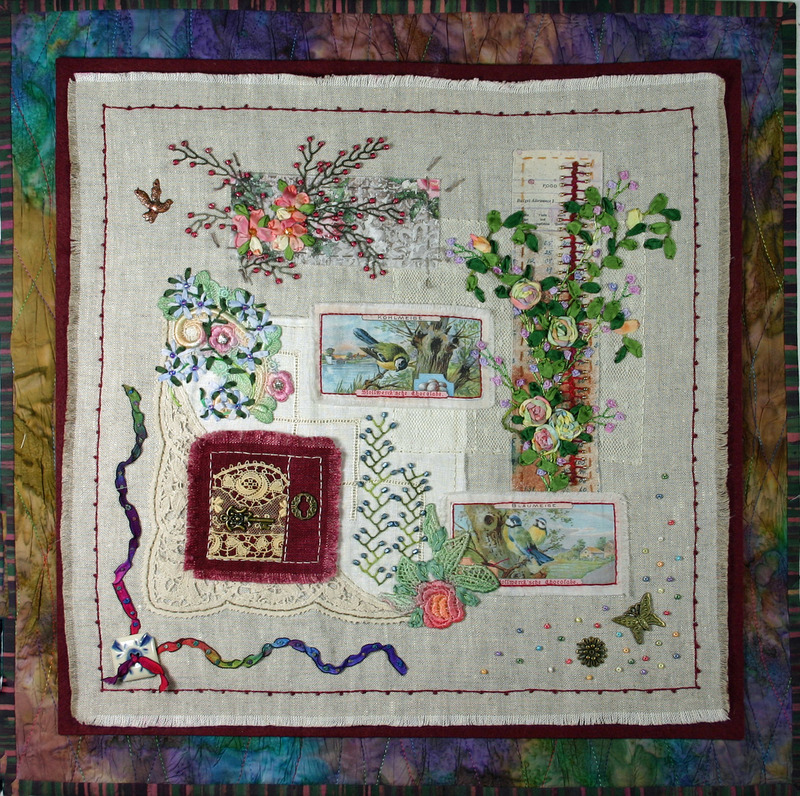 The piece is mounted with embroidery stitches to a strip quilted batik base. I am pleased with the results but I think I need some practice making birds.